Today’s feature campie is this cute1964 Aladdin Canned Ham Camper having a grand ol’ time by the beach… actually, wouldn’t we ALL have a great time camping right by the beach? So, then, maybe today’s painting is an invitation for a mini-daydream on this Tuesday! Join me for a quickie vacay with our little Aladdin! Summer surely is coming to an end here in Eastern Canada. The leaves on the trees make that dry, crisp sound when the wind is blowing. This is sign they are drying on the tree before they put their beautiful fall dresses on for a last hurrah before being blown down and cleaned away. Oh, well, now my dream is already coming to an end… as I am about to ice some cupcakes for a very special little boy who will turn 7. He wants to bring a sweet treat to school- which is the first day of school after the summer! 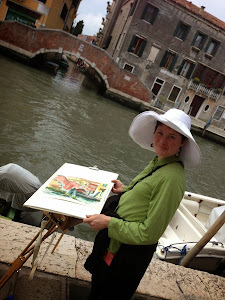 So, my friends, I have to say good bye until tomorrow- with another vintage treasure painted in watercolor! 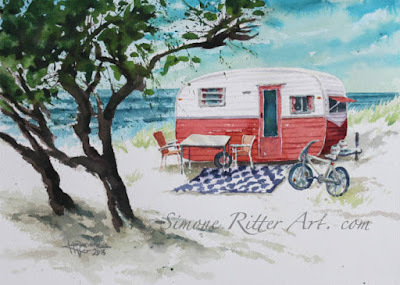 As a side note: Special Thanks to fellow artist Leslie Saeta for hosting again over 1000 artists to paint daily this September and sharing on her blog. It is so great to see new faces and old friends on her feed!